Friday June 18th 1909 Will worked int he garden most of the forenoon. I picked up things and swept nearly all the house. In the afternoon we took all the paper from both sitting and dining room I got us a bit of supper. Then picked a little pan of strawberries while Will went down to the store. When he came back we cleaned the flecks and things from the front porch and burned up the old paper from the wall. It was nine oclock when we got through and went right to bed. Saturday June 19th 1909 Will went out east to town with ["Russ?] he was back at 9 oclock and we took the paper from the parlor by noon. he went to town in the afternoon and I put in the afternoon cleaning wood work and floors. We did the regular work and went to bed early Mary Fairchild [Hartings?] died at the hospital this morning. 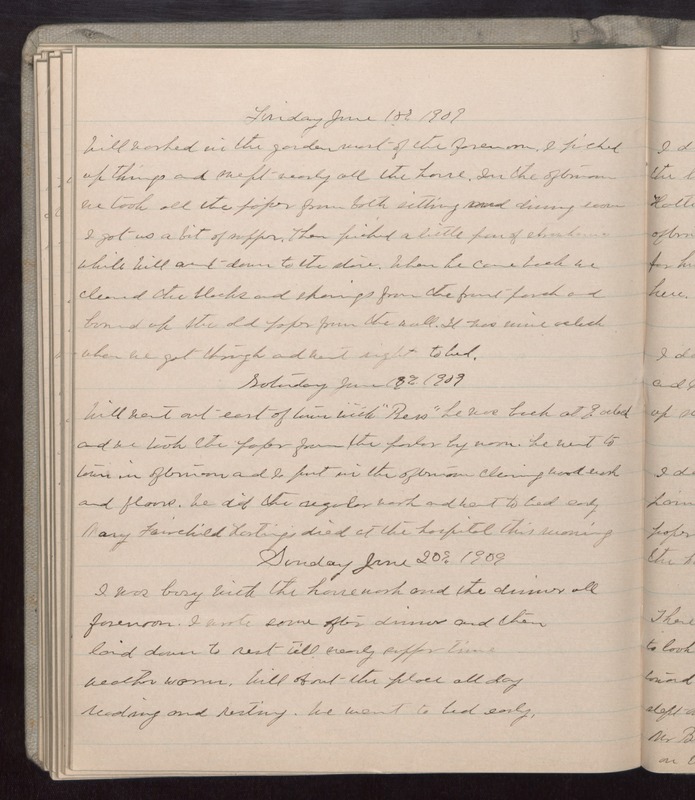 Sunday June 20th 1909 I was busy with the housework and the dinner all forenoon. I wrote some after dinner and then laid down to rest till nearly supper time weather warm. Will about the place all day reading and resting. We went to bed early.